A 30-second TV spot during the Super Bowl is one of the most highly coveted advertising spaces on the planet. It is also, understandably, one of the most expensive. But brands don't bat an eye at dropping major moola for a chance at putting together an ad that everybody is talking about the next day. But just exactly how much does it cost to place a commercial right before, during, and after the Super Bowl? We did some digging to find out how much a single second of airtime is worth in 2018, and how much that's changed over the years. This year, 30-second spots during the game are going for at least $5 million a pop, according to a report by AdWeek, though NBC was reportedly able to command even more for some. Put another way, that means advertisers are ponying up roughly $170,000 per second of screen time, and that's before you factor in the production budget and other marketing costs. For perspective, the average cost of a 30-second TV ad in regular primetime is roughly $112,000. NBC reportedly tried to woo brands this year by offering "bundle" deals that would grant advertisers airtime during both the Super Bowl and the 2018 Winter Olympics, which kick off in PyeongChang on February 9. Between the two huge events, NBC expects to rake in an astonishing $1.2 billion in ad revenue. Five million bucks is a hell of a high price just to get a single ad played on the air, but you have to consider what other costs are associated with that. For one, shooting a Super Bowl-caliber commercial is expensive. When you think of the celebs who need to get paid, the visual effects necessary to make it particularly memorable, and all the other elements needed to help them appear "big budget" it's no surprise that the average cost to produce one is well over $1 million. In recent years, many advertisers have spent even more to market the ads ahead of the game, teasing them and finding any which way to engage would-be viewers online and elsewhere. According to one marketing executive, it's not unusual for a brand to dedicate an additional 25% or more of what they paid for the slot just to market it (this year, that'd be at least $1.25 million). 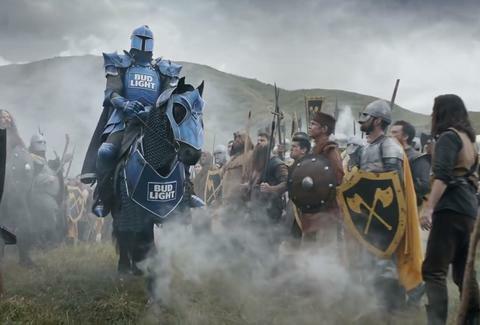 That means the true cost of the final installment of Bud Light's Dilly Dilly trilogy, the star-studded Amazon Alexa ad, the McDonald's-shading Wendy's commercial, and most other spots you see on Sunday night likely cost the brand behind them nearly $10 million all-in. A multinational corporation rolling in dough may not even blink at that, but it's still a princely sum. The cost to buy a 30-second ad during Super Bowl I in 1967 was $40,000, which would be $289,000 today when you adjust for inflation. And while there have been five years in which the average price for an ad has fallen from the previous year (1971, 1996, 2003, 2007, 2010), costs have soared in the past decade. In fact, not only has the rise in cost for an ad during the big game outpaced inflation since 2012, its jumped a whopping 87% since 2008.